China released a grand blueprint for the development of the Guangdong-Hong Kong-Macao Great Bay Area, Chinese policymakers’ latest effort to set a strategic model for the country’s further economic opening-up and innovation-driven high-quality growth. Under the blueprint, the Greater Bay Area, with a combined GDP of USD1.5 trillion in 2017, is on track to surpass the world’s three existing major bay areas – San Francisco, New York and Tokyo – to become the world’s most vigorous and largest bay area by economic output, analysts said. 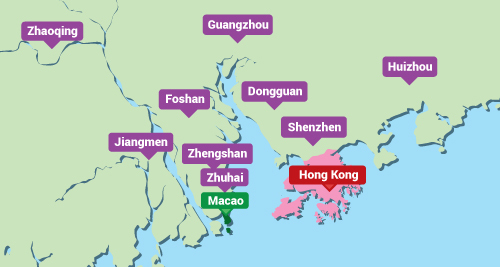 The Greater Bay Area includes nine cities in Guangdong province as well as the Hong Kong and Macao special administrative regions (SARs). It covers a total area of 56,000 square kilometers and is home to about 70 million people as of 2017, larger than the other three bay areas. Lin Nianxiu, Deputy Director of the National Development and Reform Commission (NDRC), the country’s economic planner, said in an interview with China Central Television (CCTV) that the reason why China raised the building of the bay area to the level of a national strategy is that the country hopes the area will follow the globalization trend and fully utilize the role of Hong Kong and Macao as open markets and Guangdong as the pioneer for reform and opening-up, the Global Times reports. Lin Jiang, Vice Dean of the Center for Studies of Hong Kong, Macao and the Pearl River Delta at Sun Yat-sen University, noted the complexity of the task because different social and legal systems, three separate customs territories and three currencies are involved. Hong Kong is on par with New York as a financial center. Similar to San Francisco, Shenzhen has given birth to a complete chain for high-tech industries. And the Pearl River Delta in Guangdong is the cradle of manufacturing. The Great Bay Area’s economy ranked second among the four bay areas. The successful integration of the three areas will be key to the development of the whole. The area could be turned into a magnet for key projects in fifth-generation (5G) networks, genetic testing, intelligent robotics, 3D printing and the Beidou satellite navigation system, according to the plan. China Poly Group is the most aggressive real estate developer in the area, spending CNY42.9 billion on land, according to Real Estate Foresight. Home prices in Foshan – one of the 9 cities in Guangdong that are part of the area – have jumped 35% since July 2017 to rank No 1 in the Greater Bay Area. According to the South China Morning Post, those who stand to gain from property speculation or the anticipated large foreign capital inflows into financial markets are bullish on the plan, as are those in cutting-edge manufacturing industries, whose development is a top priority of the plan. “Our team read the blueprint carefully. As a mobile robot body manufacturer and intelligent logistics solutions provider, we are so happy to see the area in which we are located will be turned into an international innovation and technology hub,” said Chen Hongbo, Vice President of Jaten Robot & Automation, an industrial robot maker in Foshan. On the other hand, those in traditional, low-tech manufacturing industries that have powered China’s export juggernaut over the last 30 years see little, if any, benefit from the plan. Traditional manufacturers and exporters said the scheme will do little to reverse their increasingly difficult economic situation and could even make it worse by increasing costs. To them, the trade war with the United States has a more direct impact. They fear the bay scheme will do little to help lower costs for factories, either labor, rent or raw materials.